This is as close to a Yemeni coffee flavor profile as I’m likely to be able to offer as part of our Coffee of the Week offerings. Yemenis are expensive and can be hard to get in quantity. 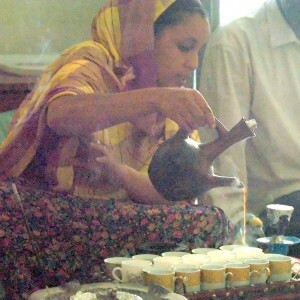 Harar is a distinct Ethiopian region, with a dryer climate and a different tradition of coffee cultivation and processing from the more familiar Yirgacheffe region. Due to the aridity of the Harar region, coffees are necessarily dry process since the amounts of water necessary for wet processing are simply not available. Overall, considering the local cultivation methods and the dry processing, and the similarity of the varieties involved, both Ethiopian and Yemeni coffees being essentially heirloom varieties, Harars are closely akin to Yemenis. They share a rustic wild character, engendering descriptives such as leather and wood, but in the case of the Harars also possessing a typically Ethiopian fruit and flower character. This particular coffee is sweet, heavy bodied and complex, with a range of flavor notes reaching from leather and wood to fruit and flower. Probably not to everyone’s taste. This is not a mild, simple coffee, but if variety in coffee intrigues you, you don’t want to miss this one.